NYC: Matthew Barney: Subliming the Vessel, at the Morgan Library. Opens Friday, in Midtown. NYC: New Harmony: Abstraction between the Wars, 1919-1939, at the Guggenheim Museum. Opens Friday. NYC: Jack Goldstein x 10,000, at the Jewish Museum. Opens Friday, on the Upper East Side. NYC: Dennis Hopper: The Lost Album, and Cecily Brown, at Gagosian Gallery on Madison Avenue. Through June 22, on the Upper East Side. NYC: Ugo Rondinone, at Gladstone Gallery on 21st Street. Opens Saturday, in Chelsea. NYC: Bruce Conner, at Paula Cooper Gallery. Through June 22, in Chelsea. NYC: Los Carpinteros, Irreversible, at Sean Kelly Gallery. Opens Saturday, in Chelsea. NYC: Extravagant Features, curated by Clarissa Dalrymple, at C24. Through June 22, in Chelsea. NYC: Martin Parr: Life’s a Beach, at the Aperture Foundation Gallery. Through July 3, in Chelsea. NYC: Scenes from the South 1936-2012, at Howard Greenberg Gallery. Opens Thursday, in Midtown. 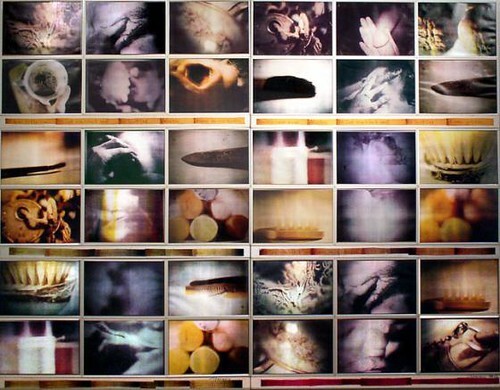 NYC: Matthew Jensen: Local Expeditions, at Third Streaming. Through August 15, in SoHo. NYC: Richard Tuttle: The Reinhart Projects, at Pocket Utopia. Opens Saturday, on the Lower East Side. L.A.: Florian Morlat, Sticks and Stones, at Cherry and Martin. Through June 1, in Culver City.